The bridge which leads people in through the city gate and into Freedom Square, has throughout its history undergone successive enlargements, losing its original functionality as a mechanism which allows people to experience crossing over into the city. 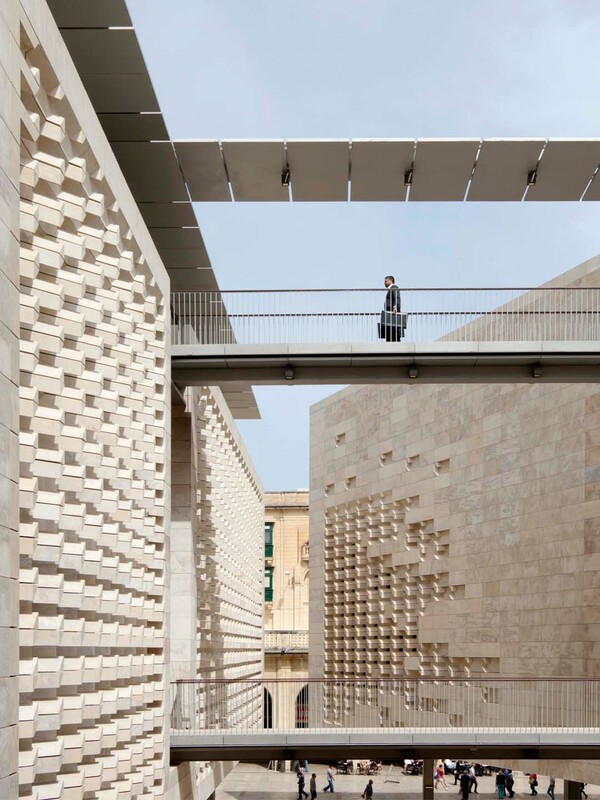 Renzo Piano’s project restores the bridge to its original dimensions of Dingli’s gate of 1633, allowing the view of the ditch to become more visible, and creating a sense of leading people into the city. The new design aims at retrieving the original expression of depth and strength that the bastion walls embody, whilst simultaneously compressing movement during the crossing. The gate is now open to the sky. The road crossing above has been demolished and two large and gently sloped stairs, reminiscent of the dramatic staircases flanking the gate before the creation of Freedom Square, lead from both St James’ and St John’s Cavaliers down to Republic Street. The gate and ditch are connected through a redesigned stair, whilst a panoramic elevator will provide the experience of the depth of the ditch, leading to the protected gardens below. The structure of the gate is made out of massive stone elements, monumentally shaped and flanked by high, framing blades of steel, the latter underlining the fracture between the past and the present. Since a modern opera of conventional size would not be accommodated within the current Opera House site, considering today’s requirements for rehearsal, back stage facilities and accessibility, the renovation sees the Opera House ruins act as a framework for a place where outdoor artistic performances may be held. The project preserves all the existing stone work and reuses some of the still existing scattered fragments to complete and embellish the ruin. A light skin supports a surrounding alignment of steel masts and columns. These carry removable walls, lighting systems, acoustic and sound equipment. When the theatre is not in use, the place works as an open piazza with a shallow stepped seating deck, totally accessible and offering the view towards the Auberge de Castille, the Churches of Santa Caterina and Our Lady of Victories as well as Saint James Cavalier. The new open air theatre caters for an audience of about 1000 spectators. The proposal to locate the new Parliament building, the primary democratic institution of the Republic of Malta, on the site which was known as Freedom Square and served mainly as a car park, stemmed from the desire to create a vibrant urbanity at the entrance to the city. The new Parliament distances itself from St James Cavalier, allowing the building to retrieve its structural character. 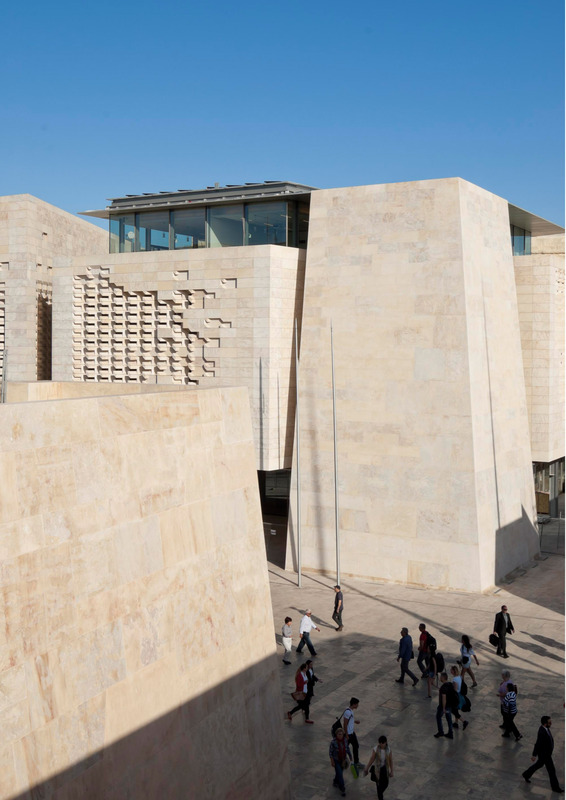 The new building has been constructed out of two seemingly massive volumes of stone, supported by stilts that recede from the facade to create an impression of suspension in air. The East block houses mainly the chamber and the Speaker’s office; the West block contains all administrative offices for parliamentary representatives, including Ministers, the Prime Minister and the Leader of the Opposition. Both volumes are separated by a central courtyard, which is the main entrance to the building. This court is shaped in a way to allow views through it from the street of St. John’s Cavalier. The old railway tunnel is connected to a sunken garden, making this structure amenable for public use while preserving its authenticity and legibility. The Parliament building does not resort to a conventional cooling system, but seeks to make use of heat exchange through pumps, as well as passive cooling for temperature control. AP Valletta associate architect with Renzo Piano Building Workshop.